Consumer prices fell for the third straight month, providing some bargains to American shoppers. The Consumer Price Index, the government's most closely watch inflation barometer, dipped 0.1 percent in June, the Labor Department reported Friday. Less expensive energy bills were a big factor behind the drop. Prices for some food items, airlines fares, computers, telephone service and personal care products also fell last month. So-called "core" consumer prices, which strip out volatile energy and food, rose 0.2 percent in June. That means core prices rose only 0.9 percent over the past year. That's below the Fed's inflation target and has core prices holding at a 44-year low. Companies are wary of jacking up prices because consumers have cut their spending for two straight months. And factories and businesses are still operating well below full throttle. The recent stretch of falling prices, both at the consumer and producer level, has stirred talked about deflation. It's a widespread and prolonged drop not only in the prices of goods at stores but also real estate, stocks and wages. America's last serious case of deflation was during the Great Depression of the 1930s. Most economists don't believe deflation will happen, although some Fed officials have recently raised such concerns. "Inflation is essentially a non issue right now, and that's good news for consumers who feel stretched and uncertain. There are some bargains to be had," said economist Joel Naroff, president of Naroff Economic Advisors. "Once consumers get more confident and are willing to spend again, they will see that stores are filled with goods at prices they like." With inflation largely nonexistent, workers have a little more buying power. Average hourly earnings adjusted for inflation rose 0.6 percent for the 12 months ended June. That was an improvement from the 0.1 percent annual decline reported in May. Economists were predicting overall consumer prices would be flat in June and that core prices would rise 0.1 percent. Because inflation isn't a problem for the economy, the Federal Reserve has leeway to keep a key interest rate at a record low near zero. Low rates should help nurture the economic recovery and nip deflationary forces. The Fed is all but certain to leave rates at record lows when it meets next on Aug. 10. Economists now predict the Fed won't start boosting rates until next year or possibly 2012. Energy prices fell 2.9 percent in June for the second straight month. 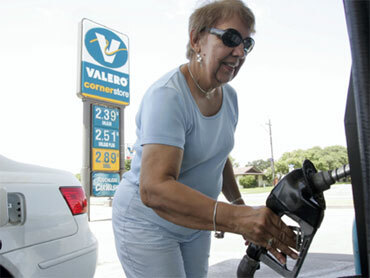 Gasoline prices led the decline with a 4.5 percent drop, handing a break to motorists. Prices for electricity and fuel oil also fell. Global oil prices have been falling amid fears that the European debt crisis will hurt growth on the continent and possibly slow the global recovery. U.S. motorists are currently paying an average of $2.718 for a gallon of regular unleaded, about the same as a week ago, according to AAA, Wright Express and Oil Price Information Service. Overall food prices were flat in June. However, prices fell for cereals and baked goods, fruits and vegetables and nonalcoholic beverages, providing some bargains for grocery shoppers. Last month prices for airline fares dropped 0.6 percent, the most since February. Prices for housing dipped 0.1 percent. Prices for personal computers declined 0.4 percent. Phone service prices dipped 0.1 percent and personal care products declined 0.2 percent. However, consumers did feel the pinch in their pocketbooks elsewhere. Prices for medical care, which continue to outpace overall inflation, rose 0.3 percent. And education costs rose 0.4 percent. Clothing prices increased 0.8 percent, the most since February 2009, but these prices are down 0.4 percent over the past 12 months.